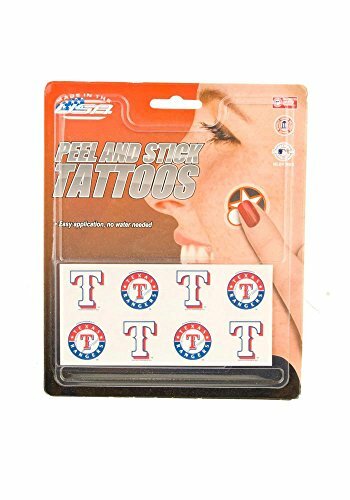 Texas Rangers MLB Authentic Eye Black. These are the exact same eye black strips that are worn on the field by the players to reduce glare from the sun. Our eye black is designed to be worn on the field and to withstand the performance demands of athletes. It is great for Little League, travel team ball, high school baseball, NABF National Amateur Baseball Federation, and AAU Amateur Athletic Association baseball. They perform well and stay on in hot and cold weather, rain, sunshine, mud or snow. They are easy to remove when you're ready to take them off. 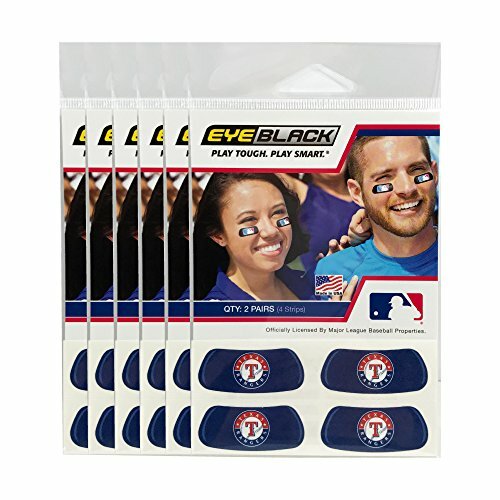 MLB eye black is also the perfect inexpensive fan item to wear to improve your game day apparel. Wear these to your next tailgate, party, or company picnic. We have styles with black, team color, pink, and camo backgrounds. We also have a Glitter style which is the same classic product with a captivating glitter finish. 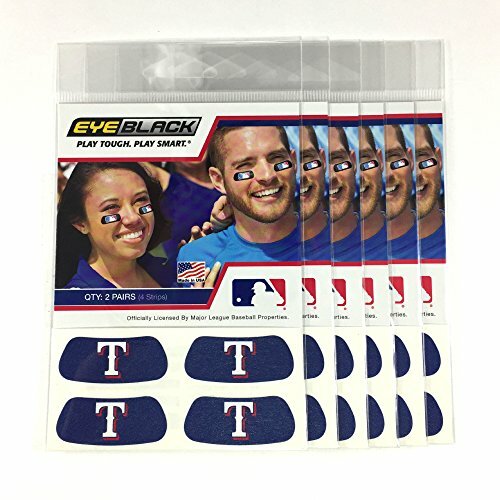 Product Details: Peel and stick Eye Black strips. 12 pairs come in a pack. Made from a breathable, thin, lightweight material to withstand perspiration. High value athletic and fan gear to take your game or fan spirit to the next level. Other MLB, NCAA and NFL Player styles are available upon request. 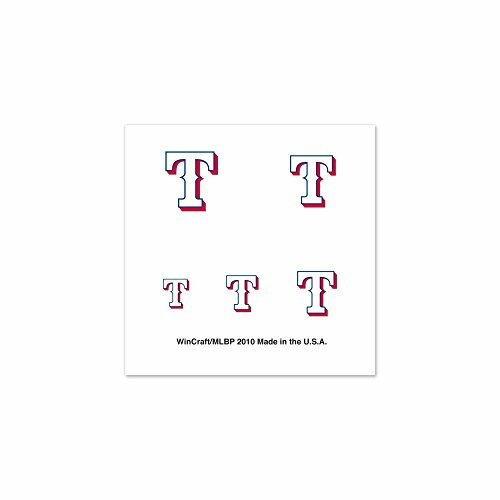 Texas Rangers MLB Face and Body Glitter Decals. 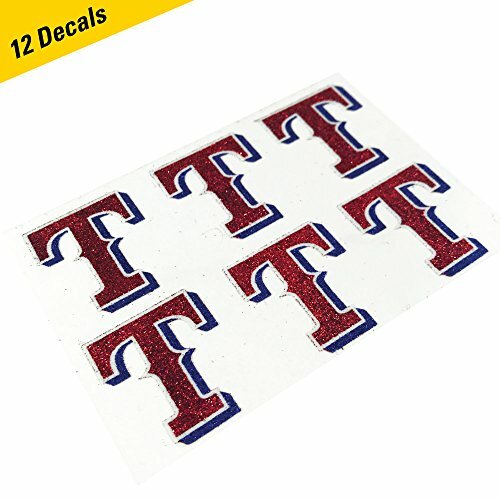 Support your favorite team with these custom shaped decals with a high quality glitter finish. The glitter doesn't come off, so you get the eye-catching look of glitter without any mess. Glitter decals are similar to a sticker. Simply peel from the sheet and apply to your face or body when you're ready to wear them. It removes easily when you're ready to take them off at the end of the game or event. These are the perfect inexpensive fan item to wear to add some sparkle your game day apparel. Wear these to your next tailgate, party, or company picnic. 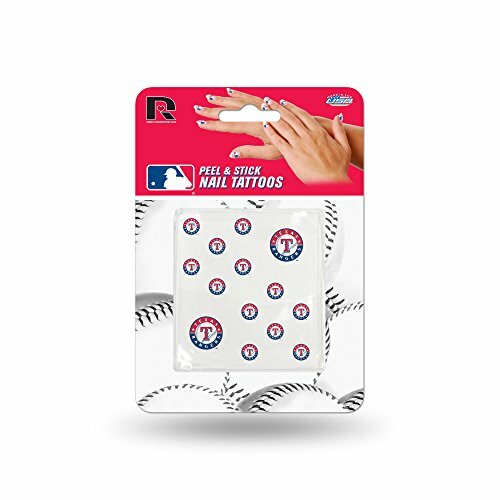 We have a number of MLB glitter designs available in our classic eye black shape. Product Details: Peel and stick Glitter decals. 12 decals. High quality no-mess glitter finish. 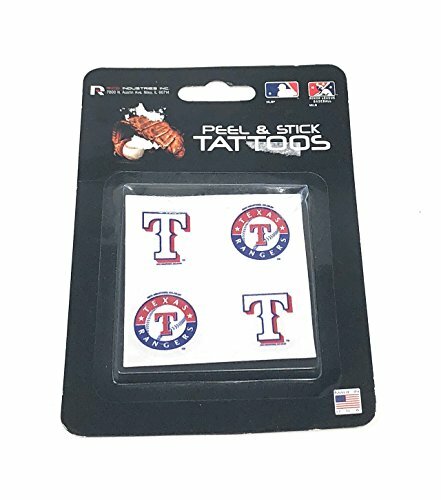 High value fan item that takes your game or fan spirit to the next level. Other MLB & NCAA styles in our original eye black shape are available upon request.